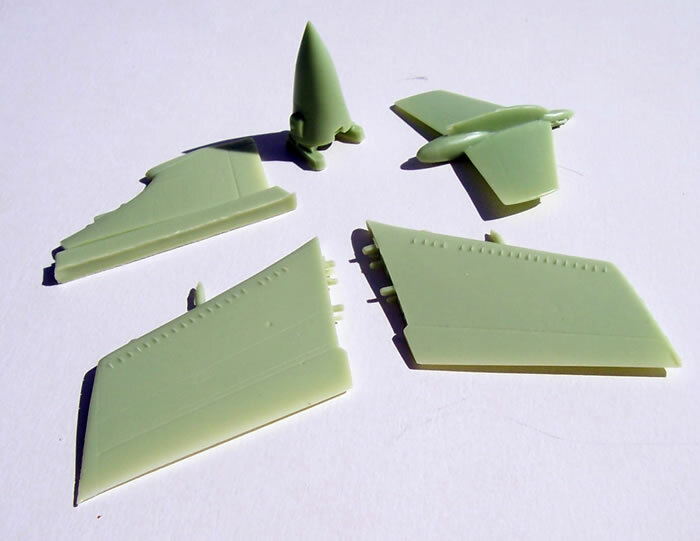 Over 100 x resin parts, 1 x Eduard pre-coloured photo-etch (PE) fret, 1 x PE fret of mainly missile fin parts, 4 x vac-from acetate canopy parts, 1 x Eduard pre-cut paint mask, and decals for 10 colour schemes. Highly detailed, thoroughly researched and very comprehensive kit. The PE det-cord may be quite a challenge to fix satisfactorily to the canopy. 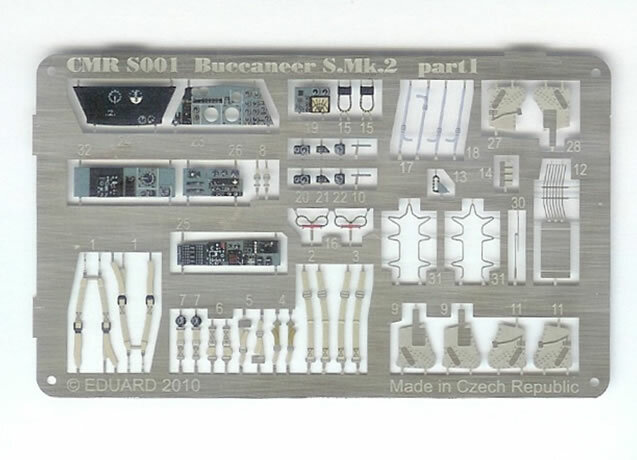 CMR produces the definitive Buccaneer kits in any scale. 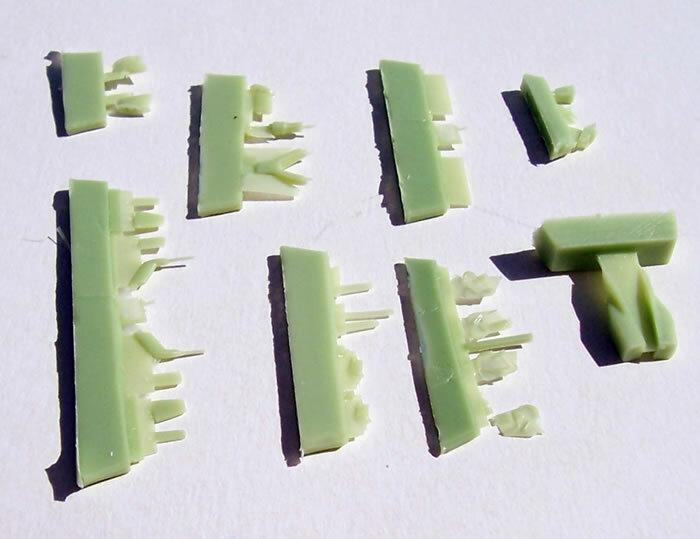 Possibly more suited to modellers with some resin and multi-media experience. It looks like a straightforward build provided the instructions are studied thoroughly in advance and the choice of subject is made at the beginning of the build. A superb kit. The Buccaneer really needs no introduction, having first served the RN in the 1960’s and then the RAF into the 1990’s, including operational service in the 1991 Gulf War. Conceived at a time when super-sonic performance was the benchmark for new military aircraft, the Buccaneer was unusual as a sub-sonic design. It was intended to operate in the low-level strike role from RN carriers at high sub-sonic speeds and in this respect anticipated later trends. After disbandment of the RN’s carrier force the RAF adopted the Buccaneer. This followed the huge disappointment of the TSR-2 cancellation, and the follow-on cancelled procurement of TSR-2’s US replacement, the F-111. The RAF under these circumstances did not consider the Buccaneer the ideal aeroplane. But with time and experience in service the Buccaneer was recognised as a superlative strike aircraft. An account of 1991 Gulf War service and the aircraft covered by the kit being reviewed here is best explained by quoting historian Andy White who is a true Buccaneer expert (see http://www.blackburn-buccaneer.co.uk/). 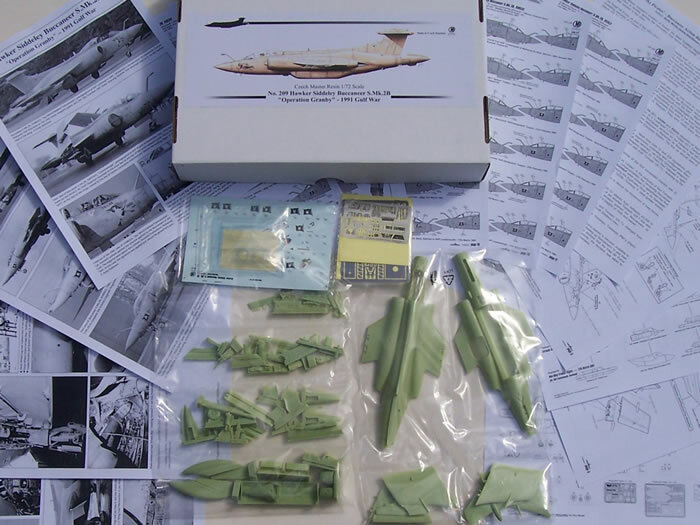 Andy has been of considerable assistance to CMR with research for their various Buccaneer kits. A slightly abridged version of the historical notes accompanying the kit is reproduced here with his permission. Following Saddam Hussein's invasion of Kuwait, the Allied Coalition began to mobilise forces in preparation of possible military action to forcibly remove the occupying Iraqi forces from Kuwait - should the United Nations fail to achieve a diplomatic solution to the crisis. The Royal Air Force, as part of the UK's Operation Granby, rapidly built up a powerful air force in the Persian Gulf region consisting primarily of Tornado GR.1's as the mainstay of any future bombing campaign, with other targets assigned to Jaguar GR.1's. It was deemed that the Buccaneer was superfluous and therefore destined to play no part in the pending action. When Desert Storm (the Coalition forces' attack on Iraq) commenced in 1990, the interdiction (to destroy enemy lines of communication by firepower) missions over Iraq carried out by the RAF were initially at low level using Tornado GR.1's armed with the Hunting JP.233 Airfield Denial Weapon. This weapon and tactics were designed for attacking Warsaw Pact airfields, however Iraqi airfields were spread over vast areas, with many alternative runways. Following the loss of several Tornado GR.1’s during these attacks, it was decided that in future airfield attacks would be at medium level (20,000 ft) using unguided ordnance – no better accuracy than WWII bombing! On 23rd January 1991, the Station Commander at RAF Lossiemouth was asked how soon he could get a Squadron of Buccaneers to the Gulf? Even though in late 1990 it had been deemed that the Buccaneer would not participate in Operation Granby, it was still the only laser-target marking aircraft then in service with the RAF – fitted with the AN/AVQ 23E 'Pave Spike' Pod. For this reason, the decision was taken at RAF Lossiemouth to investigate the feasibility of medium level (18,000-29,000 Ft) target 'Spiking' with Buccaneers, as well as maintaining the existing low level tactics. Note: Iraqi small arms fire was cable of reaching up to 18,000 ft. In rapid time, Buccaneers from both 12 and 208 Squadrons were returned to RAF Lossiemouth from exercises in Gibraltar and RAF St. Mawgan. They were made ready and painted in Desert Pink ‘ARTF’ (Alkali Removable Temporary Finish). At 04:00 on Saturday 26th January 1991 the first of the Buccaneer S.Mk.2B's: XX899 and XX892 departed on their non-stop nine-hour flight to Muharraq Air Base, Bahrain, in the company of a Lockheed L-1011 TriStar KC1 Tanker. In advance, no less than 230 support crew as well as some of the chosen Buccaneer aircrews for the missions had left by RAF Hercules C-130 transports. Also, AIM-9L ‘Sidewinder’ missiles were delivered to Muharraq Air Base for the arriving Buccaneers - replacing the usual AIM-9G's carried for self-defence in the European theatre. The first six aircraft were to be dispatched in three pairs on consecutive days. A total of eighteen Buccaneer crews were chosen for 'Operation Granby' - taken from both 12 and 208 Squadrons, plus crews from 237 OCU (Operational Conversion Unit). Following arrival, the asymmetric underwing tank configuration fitted to the Buccaneers during the non-stop transit flights from RAF Lossiemouth was removed - an empty 'Universal' weapons pylon replacing the underwing fuel tank on the starboard inner position (weapons station 2). There then followed a rapid 'In-Theatre' work-up, carried out over the Saudi Arabian desert in conjunction with RAF Tornado GR.1's - finishing by the 1st February 1991. - Buccaneers were 'paired' for each mission target with one aircraft dedicated as ‘Leader’, in the company of four Tornado GR.1's. This ensured that in the event of an aircraft or equipment going 'u/s' (Unserviceable), the remaining Buccaneer was available to 'Spike' targets for his partner's two Tornados. XW547/R and XX899/P were chosen to spearhead this first mission on the 2nd February, the target being the strategic highway bridge crossing the Euphrates River at As Samawah. This bridge was destroyed with devastating accuracy by no less than six ‘UK 1000lb. Paveway II’ laser-guided bombs. Between the 2nd and the 11th February 1991 the targets chosen were designed to disrupt the movement of Iraqi forces, i.e. Bridges, POL (Petrol, Oil, Lubricant) and Tank production facilities. During these early missions the Buccaneer S.Mk.2B's 'Spiked' the Tornado GR.1s' attacks from between 22,000 to 25,000ft, always flying slightly above the Tornados. However following the loss of yet another Tornado GR.1 this was revised upwards, as the Tornados wanted to now fly above 25,000ft! This decision pushed the Buccaneers up commensurately, usually to around 28-29,000ft - not bad for an aircraft that revelled in heights of 100ft and below! From the 12th February 1991 the mission targets for the Buccaneer S.Mk.2B's and Tornado GR.1's changed from Interdiction to Counter-Air. The targets designated were primarily HAS (Hardened Aircraft Shelters) sites. From the 15th to the 20th February 1991 this expanded to other 'Airfield' targets, i.e. Runways, Taxiways, PBF's (Pilot's Briefing Facilities) and Bunkers. Around the 20th February 1991 the TIALD (Thermal Imaging Airborne Laser Designators) started to become available to the Tornados. This enabled some of the Tornados to 'Self-Designate' their targets, so freeing up Buccaneers to add their own considerable weight of bombs to the Counter-Air campaign. As it became more obvious that the Iraqi Air Force refused to take to the air, the Allied Coalition forces now having gained full 'Air Superiority', the decision was taken to remove the AIM-9L Sidewinders from the port outer weapons pylon (station 3) of the Buccaneers. From the 21st February 1991 onwards, the Buccaneers were armed with one ‘UK 1000lb. Paveway II’ laser-guided bomb on the port outer weapons pylon (station 3). Having first 'Spiked' for the Tornado attacks, the Buccaneers having the greater operational range and higher cruising speed than the Tornado GR.1, were then free to loiter over the target area, and use their AN/AVQ 23E 'Pave Spike' Pod to 'Self-Designate' their own ‘UK 1000lb. Paveway II’ laser-guided bomb - the real 'Multi-Role Combat Aircraft'! With the starboard inner position (weapons station 2) already spare, this enabled the Buccaneers S.Mk.2B's to increase their effective bomb load now to two LGB’s. The attack would usually take the format of a tip-in from around 27-28,000ft into a 40-degree dive, with weapon release taking place around 19/20,000ft depending on how quickly the laser acquired the target. Because the area of the sighting basket for the AN/AVQ 23E 'Pave Spike' Pod was restricted to about 45-degrees, the Pilot would usually pre-align the Buccaneer on the chosen target, at which point the Navigator would take over using the display from the 'Pave Spike' video to mark the target until the LGB's hit. There were other factors, such as cloud base, which would sometimes alter the attack profile including: a steeper dive to target of around 50 to 60-degrees for greater accuracy and a minimum ‘UK 1000lb. Paveway II’ LGB release height of around 16,000ft. During the latter part of February, the weather became the biggest opponent to the Counter-Air campaign - the ‘UK 1000lb. Paveway II’ laser-guided bomb being an 'on the day' weapon. If the target was obscured then it wasn't released. Between the 25th and 26th February 1991 all Buccaneer mission sorties were cancelled due to weather. Fearing a last ditch effort by the Iraqi forces in the South to mount a counter-offensive against the Coalition forces, a major assault was carried out by the Buccaneers on the 27th February 1991 against three Iraqi airfields: Al Taqaddum Airfield, Habbaniyah Airfield and Shayka Mazhar Airfield. The latter becoming famous for the destruction of two Iraqi Transport aircraft on the ground by Buccaneer 'self-designated' LGB's. On that day, four Buccaneer S.Mk.2B's were delegated to attack the Shayka Mazhar Airfield - attacking in pairs. The first two aircraft XV863/S and her partner XX899/P were recorded as DNCO's (Duty Not Carried Out) because of weather. However, the second pair was highly successful. Following a successful attack with Tornados on the runway intersections, the crew of XX901/N spotted several Iraqi aircraft on the ground. The crews of both Buccaneers decided to 'self-designate' their own LGB's for each chosen ground target. XX901/N, flown by Flt. Lt. Glenn Mason and Sqn. Ldr. Norman Browne was the first to attack from a steep dive. Releasing two ‘UK 1000lb. Paveway II’ laser-guided bombs, both found their 'Mark' - hitting what was thought initially to have been an Iraqi Air Force Antanov An-12 'Cub'. For some inexplicable reason, both failed to explode, but the 'Pave Spike' video clearly showed an accurate weapon strike with ground impact below the 'Cub' and it's back broken - rendering the aircraft destroyed (at the end of the War, Coalition forces arriving at Shayka Mazhar Airfield discovered it was a captured Kuwaiti Air Force C-130 Hercules serial number KAF322, being operated by the Iraqi's). It was then the turn of the second Buccaneer of the pair XX894/O, flown by Wg. Cdr. Bill Cope (Detachment Commander) and Flt. Lt. Carl Wilson, to attack it's ground target, another Iraqi Air Force Antanov An-12 'Cub'. Placing the aircraft in a 40-degree dive towards the Antanov An-12 'Cub', both LGB's were released on the first pass at a height of approximately 19,000ft. The result was a 'direct hit' on the starboard inner wing with a huge explosion probably due to full fuel. Both attacks successfully completed XX901/N and XX894/O returned to base – having already overtaken their Tornado GR.1’s who had left the scene some minutes earlier. The final mission of XX885/L was on the morning of the 27th February 1991 against the Al Taqaddum Airfield Hangars & Ammunition Store. However on returning to Muharraq Air Base, Bahrain, ground movements meant that she was unable to return to her dedicated Hangar area and was therefore billeted in that of XX894/O instead. Meanwhile having returned from the successful attack at Shayka Mazhar Airfield, XX894/O was rearmed and flew a second successful mission, destroying Ammunition Stores at Al Taqaddum Airfield. Missions completed, all Buccaneers returned to base. News of the successful destruction of two Iraqi transport aircraft on the ground at Shayka Mazhar Airfield reached the ground crews. In the excitement of the moment members of the ground crews painted red silhouettes of an aircraft on the noses of both Buccaneers parked in the successful aircrafts' dedicated Hangar areas - not realising that XX885/L was in fact the wrong aircraft – it should have been XX894/O. Finally, on the 17th March 1991, all twelve Buccaneer S.Mk.2B's took off from Muharraq Air Base, Bahrain for the nine-hour non-stop return flight to their home base at RAF Lossiemouth in Scotland, accompanied by Handley Page Victor K.2 Tankers – the detachment by now having received the nickname ‘Sky Pirates’. By the end of the campaign, the 12 Buccaneer S.Mk.2B's from RAF Lossiemouth had flown 250 sorties during Desert Storm with not one being cancelled through 'Unserviceability'. They 'Spiked' a total of 169 LGB's for other aircraft as well as dropping a total of 48 LGB's of their own. No Buccaneers were lost during Operation Granby and the two 'Back-up' aircraft XV332 and XX893 painted in Desert Pink 'ARTF' (Alkali Removable Temporary Finish) and fully prepared, were in the event never needed in the Gulf - spending the entire period ensconced at RAF Lossiemouth. 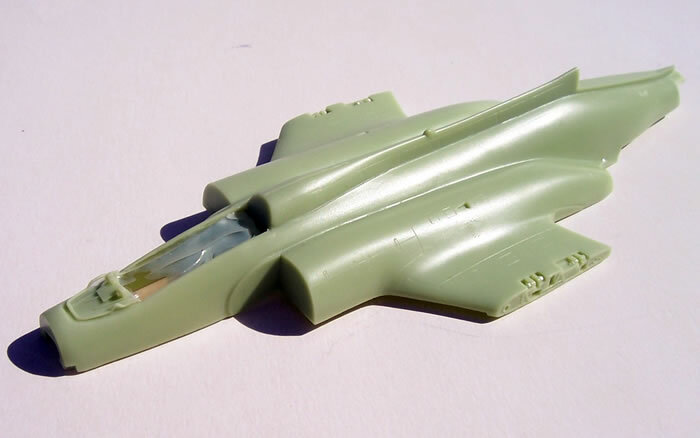 There have been several 1/72 Buccaneer kits Airfix’s first effort was an S.1 although I think I have read it was close to the NA.39 prototype. 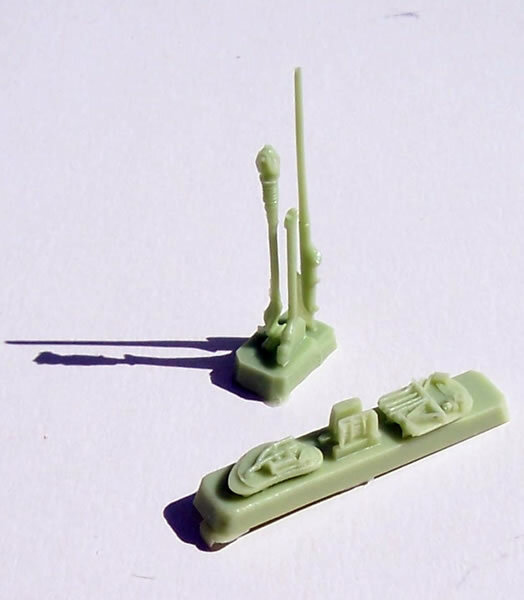 Airfix later issued a generally quite reasonable S.MK2B. Matchbox and Frog also kitted the S.MK 2B, and these had their good and bad points like the Airfix Kit. 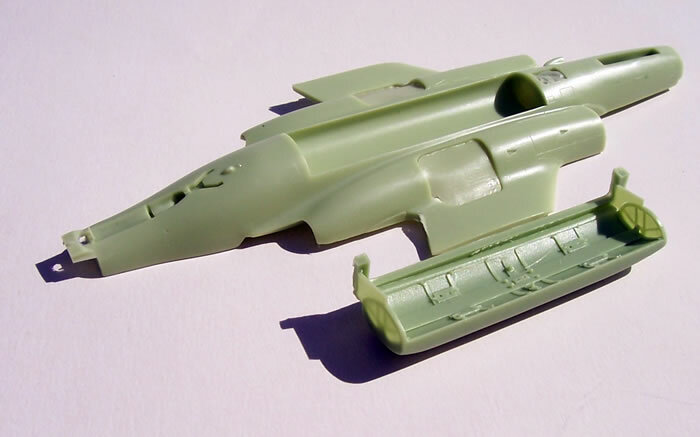 Finally, and by far the best, was CMR’s first Buccaneer multi-media resin kit released about four years ago. 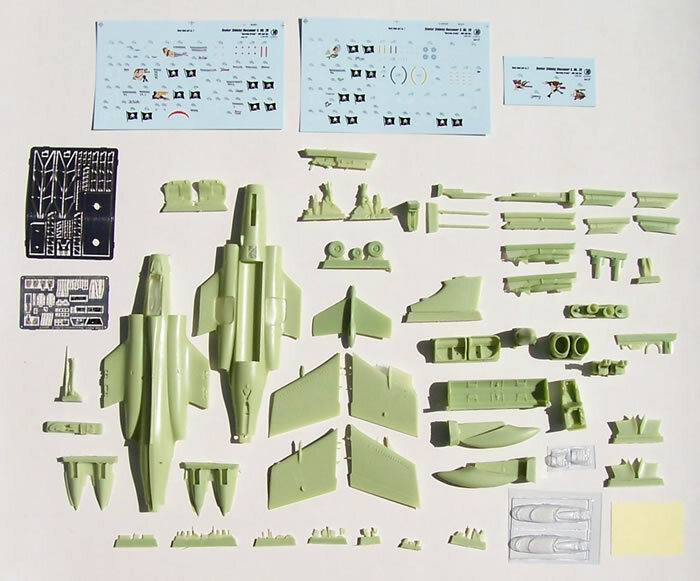 It is this kit which has formed the basis for subsequent CMR Buccaneer releases. In each case these have been very highly researched, and Andy White has consulted with CMR on all of the major and minor variations associated with each Buccaneer version being kitted. 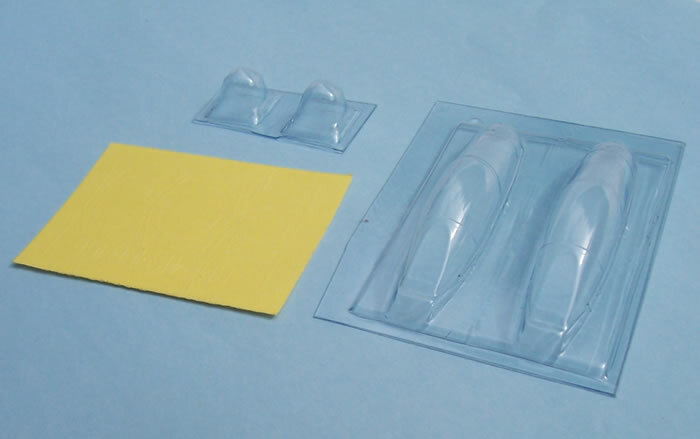 The kit comes packaged in CMR’s now standard sturdy top opening box. The parts and decals are in heat sealed plastic bags, which in turn are sealed in a further bag with the instructions and photo walk-around. The straightforward instructions consist of nine A4 pages with very god quality graphics (see here). The parts map and constructional illustrations are very clear and easy to follow, as is the comprehensive painting and decal guide. Colour notes and other written instructions are in English. Seven more pages provide a photo walkaround focused on various detail aspects of the aircraft, and another two with aircraft historical notes (reproduced above). Finally no less than 14 pages cover camouflage and markings. 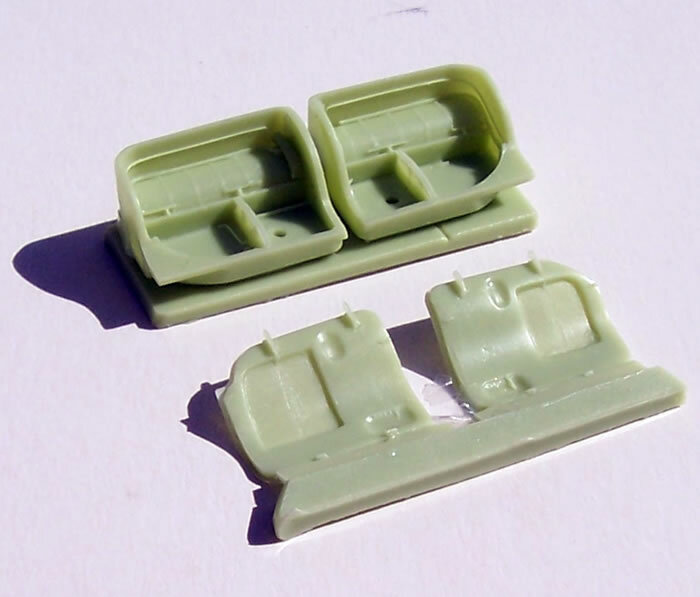 The kit’s resin parts are no longer in CMR’s usual cream colour; instead a pale green has been used. This change is to make the delicately cast detail more observable. 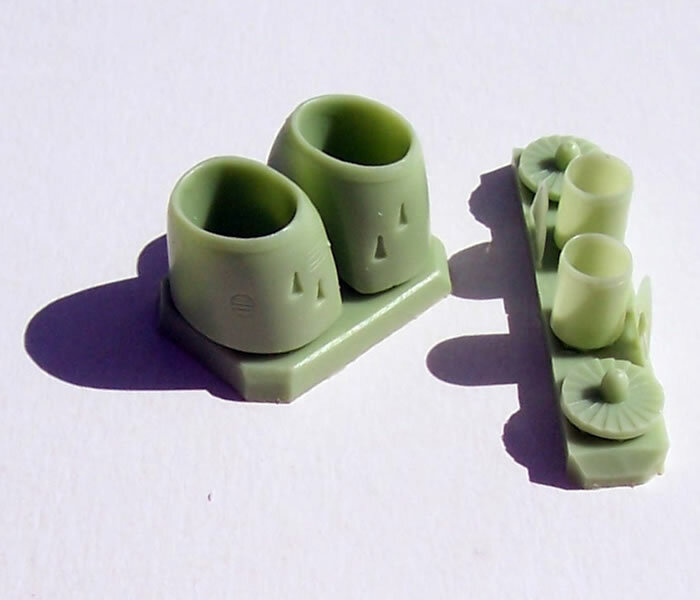 Parts are very nicely with some small areas of mould flash in understandable places that should be very easy to remove. The kit is awash with detail, although some reviewers have suggested that the wheel wells would benefit from a bit more plumbing in them. I’m inclined to agree, although they are still good. Considerable attention has been paid to providing optional position parts. Detail levels are further enhanced by the pre-coloured Eduard PE set provided, which includes some very nicely done seatbelts. Rather than give a blow by blow account of the kit parts I’ll rely on the accompanying images and list options and weapons choices. Original or bulged bomb bay door with fuel tank. Retracted or lowered tail-hook and skid. Bulged 425 Imp. Gallon Bomb Door Tank (Mod.5300). There are comprehensive guides concerning weapons fits (see here and here) showing what should go with which colour scheme and so on, as well as dimensional locations for weapons pylons. I would recommend that builders spend some time studying this aspect of the kit, and note that the weapons fit are cross-referenced to the various colour schemes, reflecting observed payloads for the aircraft concerned. 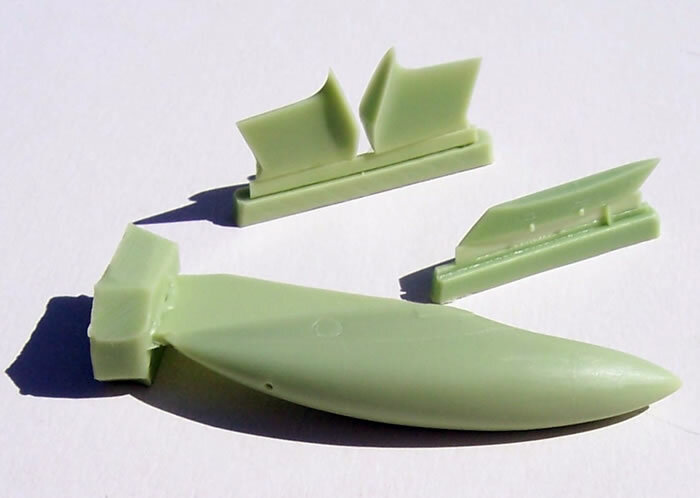 The plain PE fret has numerous missile fins as indicated in the list above, as well as a jig to assist with locating these. 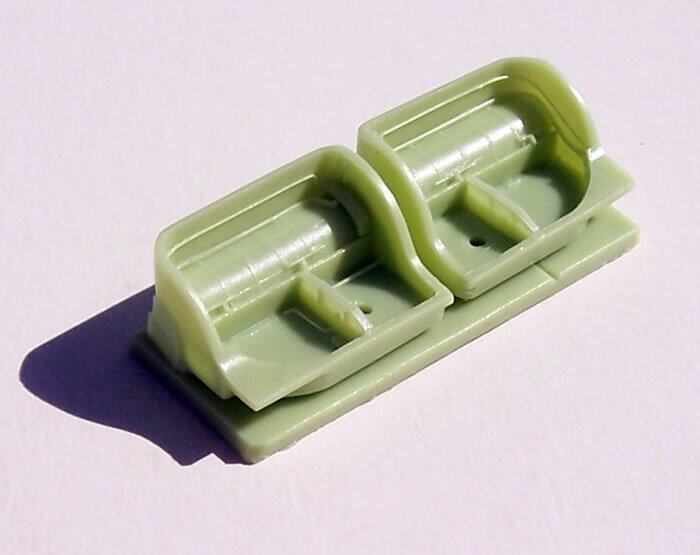 The PE set provides the ejection det-cord to be attached inside the canopy. I assume that this is because a vac-formed representation would be too soft and blurred. Fitting this will be a challenging task I feel (it would be for me at least! ), and I’d be inclined to practice on spare canopies with scrap PE. I think that a coat of Future will provide some protection from super-glue or other methods of bonding the det-cord. I wonder if an Eduard pre-cut paint mask would work? Although this too would be tricky to position inside the curve of the canopy, but at least the risk of damage would be reduced. 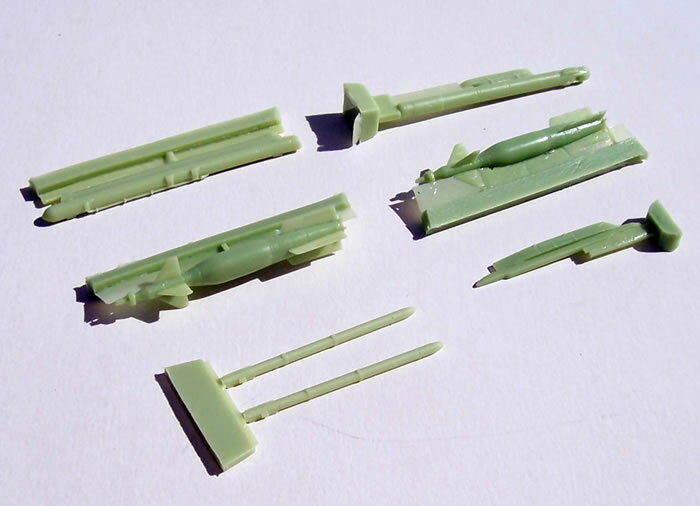 At first the number of parts and sheer amount of information can make this appear a complex kit. But in fact assembly is quite conventional, aside from the horizontal split to the fuselage, and the build should be fairly straightforward. Decals are typical of CMR, being well registered and suggest good opacity. 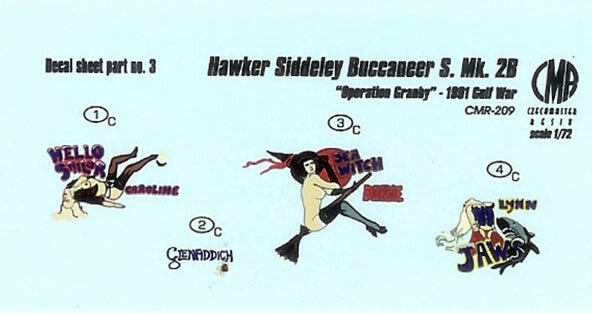 A dozen aircraft schemes are featured, although in each case there are variations to cover mission markings changes on different dates. The colour notes are very thorough, for example there are three different paint finishes for the inside of the engine air intakes dependent on which aircraft is being modelled. XX885 - L, "Hello Sailor/Caroline/Famous Grouse"
XX892 - I, "Glen Lossie"
XX901 - N, "The Flying Mermaid/Kathryn/Glen Elgin"
Paint call-outs include FS equivalents, and painting of small detail parts is well covered. A nice touch I noticed on the painting guides is that they include the characteristic exhaust stains on the rear fuselage. 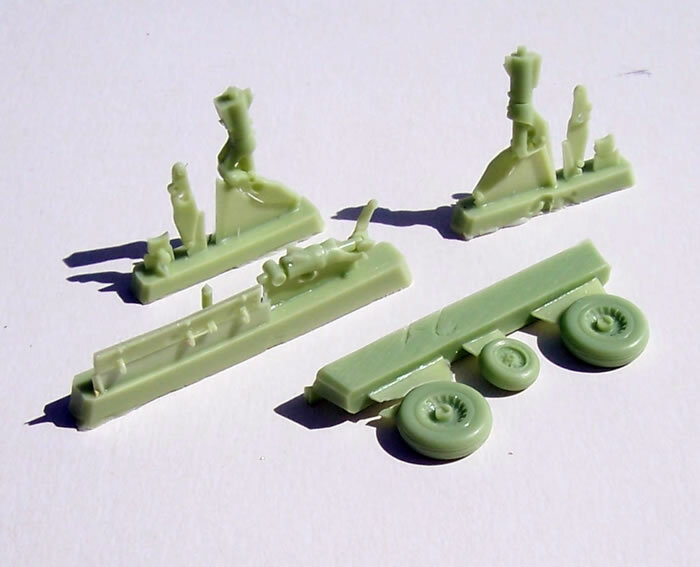 An indication of the thoroughness of this kit is that there are two styles of tiny stencil decals for the picketing points that appear on the undercarriage legs, depending on which scheme you have chosen to model! 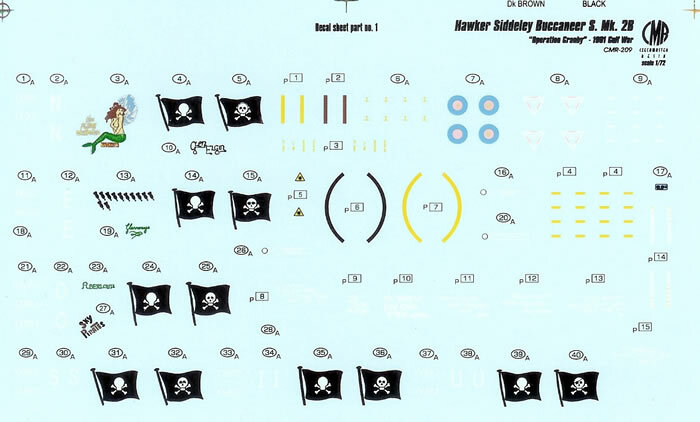 The decal sheet is extensive and will need to be carefully cross-referenced to the paint and decaling guides. This is a superbly executed kit with high levels of detail and a plethora of options, yet it looks to be a fairly straightforward build. It is produced to a very high standard with a wealth of information and photos concerning the subjects covered by the kit (In my experience at least, this aspect is unequalled by any other brand I’m familiar with). The degree of research that has gone into the kit is phenomenal, whether applied to the airframe, weapons choices or markings variations. 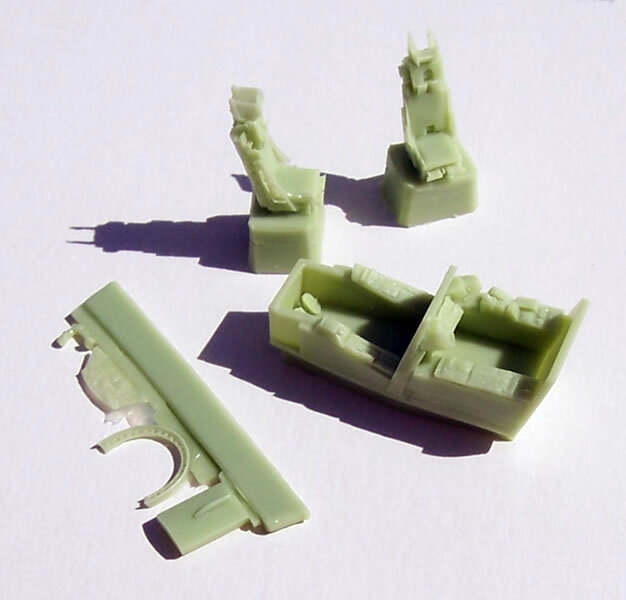 Yes, the kit is an expensive when compared to injection moulded jet subjects of similar size, but not so when compared to similar sized resin kits produced to comparable standards. Value for money will depend on your point of view and what you’re looking for. 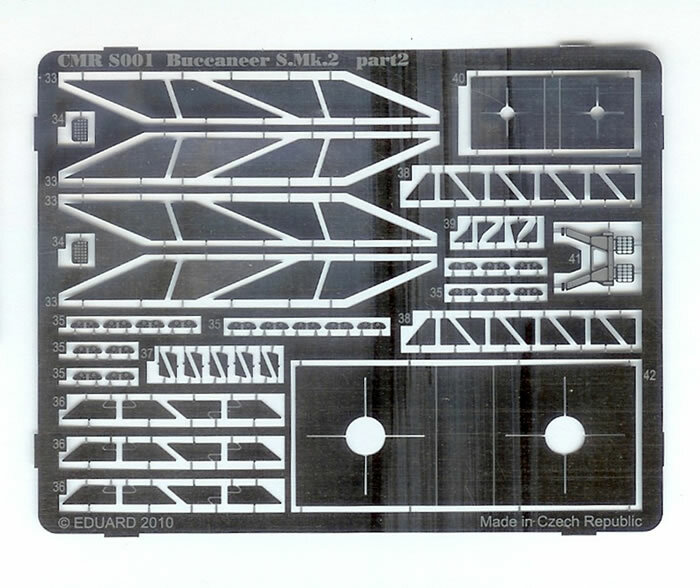 But if you want the definitive kit of the Buccaneer in any scale then this or one of the other CMR Buccaneers is the kit for you. If you need any more convincing take a look at this image of three finished CMR Buccaneer models at the 2007 Nurnberg Hobby Exhibition where it was awarded Best Kit of the Year 2006 in the category of "Aircraft models in 1/72 scale produced in limited series"